The Greek Government has banned the use of all animals in circuses following a six-year campaign by ADI and the Greek Animal Welfare Fund (GAWF), backed by over 50 local animal protection groups. The new animal protection law also addresses a number of important issues concerning stray animals. 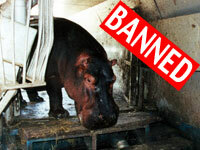 During the campaign we filmed horrific misery, such as a hippo confined in a small, filthy cage on the back of a truck with a stinking pool barely bigger than a bathtub. The Greek campaign, like many others around the world, really took off in 1998 with the launch of ADI’s ‘Ugliest Show on Earth’ video – the world’s first long-term deep undercover investigation of animal circuses. The exposure of the suffering of animals in UK and European circuses and winter quarters shocked the world. It resulted in three unprecedented cruelty convictions in the UK. Over the next few years, it helped campaigners to secure bans in towns and cities in South America, the US, Asia, the UK and Europe. Some national bans were gained, too, such as Singapore and Costa Rica; others followed. And towns such as Thessaloniki in Greece acted quickly. In 2006, we decided to build on the successes in Greece and press for national legislation. Armed with a new investigation in Greece, we joined forces with GAWF and produced special campaign materials. A series of media launches were held in succession in Crete, Thessaloniki and Athens. More bans in towns and cities followed, in Patras, Xanthi, Eleftheron, Kavala, Glika Nera Attikis, Elefsina, Lamia and Nea Makri, Thermi, Kalamaria and PrevezaMalia, Kalamata, Serres and Aridea Pellas. Footage of animals suffering in circuses in Greece, including an elephant being beaten and dragged with a bullhook at Circo Massimo in Florina, disgusted the public and people wanted action. Over the next four years a national schools writing and painting competition included hundreds of entries condemning circus suffering. By 2010, the Ministry of Agriculture indicated that there would be a ban; it took two more years to secure it. Greece is the second country in Europe, behind Bosnia and Herzegovina, to ban any and all animals from circuses. Austria and Croatia currently have bans on wild animal acts, and several European countries including Portugal and Denmark have measures to ban or phase out wild animals in circuses. Pictured, ADI Campaigns Director Tim Phillips is interviewed during a series of launches across Greece. 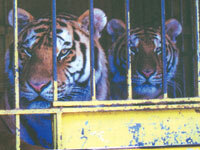 Bolivia was the first country to introduce a national ban on any and all animals from circuses. This led to the ADI enforcement operation with the Bolivian wildlife authorities, rescuing every animal (lions, primates, other wild animals and horses) from circuses that defied the law. ADI and GAWF are committed to assisting the Greek Government with enforcement of the ban. Please click here to donate now and help us continue to expose and end the suffering.